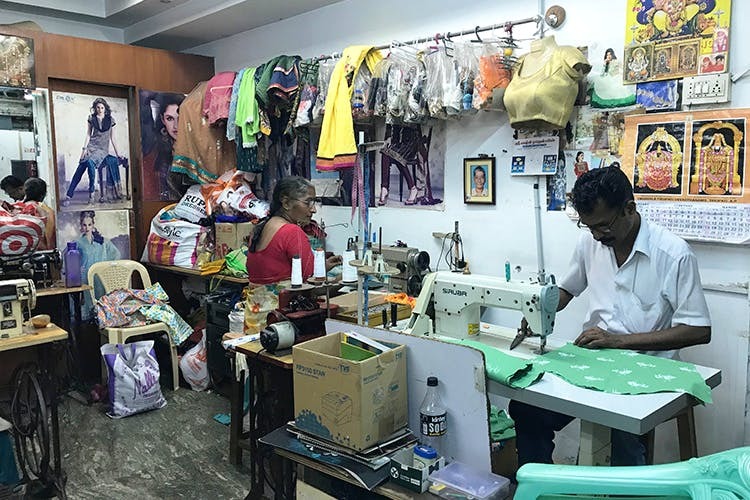 We sure have numerous tailors in the city, stitching tons of ethnic wear but this week we went around Egmore to discover fashion tailors, who put together off shoulder tops, summer dresses and everything western. Starting at just INR 350, guys! Located on the ground floor of Spencer Plaza, is this retail outlet which also has a master tailor. The senior tailor here manages to stitch up some well-fitting one-pieces and tops. You can get yourselves some trendy sleeveless tops and dresses stitched at INR 350 and INR 550. They also stitch party-wear blouses and gowns. Yes, getting that perfect flowy satin gown just got easier. The pricing of the gowns vary with material and layers required, starting at INR 1,200. We feel this is not the place for precise, complex designs, but more of a place to get your everyday comfortable western wear stitched. Quite a find this one, we were first lost trying to get around this place, but once we did, it was so worth it. The boys here, who have their setup inside a men’s clothing shop called Style Icon, actually do a great job with summer dresses. We got ourselves an off-shoulder Kalamkari dress and green lehenga blouse stitched here and both were perfect. It’s not every day that off-shoulder fittings come out perfect, but these people manage to do a great job at that. And all this at just INR 600 to INR 1,000 only. Make sure to take a sample design or dress along with you, in case you’re getting the complicated stuff stitched and trust them with the rest. Also, on special request they finish up your outfits in less than two days if needed. Right after Spencer Plaza, another arcade for tailors has got to be Fountain Plaza. The basement of this complex is filled with tailors in a row and Somu happens to be a popular one. With several western outfit catalogues, this is the spot for all your modern stitching demands. They stitch breezy summer dresses, cocktail gowns, wedding outfits and even party wear LBDs. The place is known to be an adda for college goers and many fashion students, who get most of their designs stitched here. The quirky materials and patterns lying all around this place is proof of the same. Their stitching charges start at INR 350 upwards. These guys also help jazz up your fabric with borders and other add-ons if required. Pioneers in college fashion shows and other programs, most of the MOP, WCC and Stella crowds head here for their wardrobes. Located right next to Somu tailors, in the basement of Fountain Plaza,get almost every pattern you demand here! From cold-shoulders to off-shoulder tops, high-necks, heavily embroidered outfits to spaghetti tops, you name it and Jeebi has got you covered. Here too the price varies with the detailing of the design needed and length of course. Their starting range is INR 500, while cost for stitching gowns goes up to INR 2,000 as well. We got ourselves some bridal gowns stitched as part of a college fashion show and the finish was both classy and neat. Carry a photo of your design always while you visit these stores and a sample pattern if possible. You don’t want your amazing fabric to get ruined do you?